Hey, Astraia. I DON’T LIKE YOU. The scene of Nyx visiting her twin sister and finding her much changed and more vicious nibbled at my attention as I tried to focus at The Day Job. I tucked the book – open – under a notebook and stole glaces, taking in a few paragraphs at a time. I had to find out what happened next! Finally, I abandoned all pretense and devoured the final pages, feeling my anger toward Astraia burn and then fade into grief, and finally disappear with a smug sense of satisfaction. 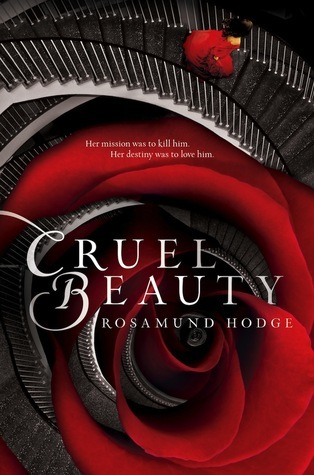 Cruel Beauty is a retelling of the beauty and the beast tale, filled with elements of fantasy, mythology, ancient history, and legends. I admit that I found the first few chapters slow and even contemplated stopping. But I’m so glad I didn’t. As soon as Nyx stepped across the castle threshold, I was hooked. Trapped and wed to a demon – the Gentle Lord – Nyx has malice in her heart and murder on her mind – all in the name of avenging her mother and liberating her country. But while the mission always seemed all important (hopeless, but essential), Nyx truly meets her match in the Gentle Lord. The Gentle Lord is mocking and mercenary, but he’s also genuine and patient and the perfect match for Nyx. Nyx is bitter and caustic, having known for years that her father bargained her to a demon. She was born, in a way, to sacrifice herself in order to save all of her country. Together with Shade, the Gentle Lord’s shadow, Nyx and her demon husband navigate a darkly enchanted castle with myriad shifting rooms and chambers that hold magic and danger and secrets from the past 900 years or more. Cruel Beauty is full of great gems of text that make me wish for my own copy that I can highlight and tag. At the very least, I’m going to go through the story again with pen and notebook in hand to write down some of my favorites. A great debut novel for the author! But I still don’t like Astraia. I could get trapped just in gazing at that cover alone! Wonderful review, and I will be looking for this one. Paul is picking this up for me at the library today! I can’t wait to read it!